Unbiased Pros & Cons, Recipes & More! 10 Cool Pocket Knives You Need To Check Out! Home General 10 Cool Pocket Knives You Need To Check Out! Remember, Not Everyone’s Looking For The Same Thing! Deciding what pocket knife to get can be a tricky affair, and that’s because there’s so many different choices available in the market. It’s important for you to understand your specific needs and what you’re looking for. Do you have a preference for a specific steel type? 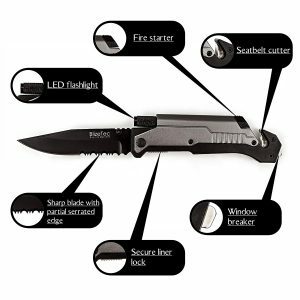 Are you looking for a multi tool pocket knife? How important is size to you? Is humidity something you need to factor? Ask yourself these questions before you even start looking. Remember, what someone else is looking for may not necessarily be what you’re looking for! Each of the 10 blades I discuss below are different in their own way, and that’s because I want to give you a broad idea of what’s available today. Everything in this post is my honest opinion and preference. There are other great tools out there, but for me these are the best! Beautiful, sleek, and deadly sharp. If there ever was an apocalypse, this is the tool I’d have in my possession. Zombie killer, that’s what this is! MT-A705: A Combination Plain/Serrated Edge That’s Capable Of Doing Some Serious Damage! I love the way this looks. It kinda feels like something right out of a video game (definitely a zombie video game!). The black/gold combination in my opinion looks sick, but there’s other choices too (black/green, black/purple, blue/silver). If you’re talking about cool pocket knives, this definitely fits the bill. The Less I Spend The Happier I Am! And you should be too! I’m all about cheap deals, and this doesn’t fail to deliver (click here to check out latest pricing on amazon). Yes the MT-A705 is cheap, but it’s incredibly effective and built to last. The edge is nice and sharp right out of the box, and the knife feels very comfortable to handle. It is a tad bit on the heavier side, however. Let’s be honest……for what you’re spending don’t expect that you’ll be getting a high quality steel. Yes it is sharp but it won’t retain it’s edge for too long, and at that point you’ll need to sharpen. Since it’s a combination edge (plain and serrated), it may take some effort and time to sharpen. Ahhh the famous Spyderco Tenacious. A blog about cool pocket knives would be incomplete without discussing this guy. In case you haven’t heard about the company Spyderco, they’ve been designing and manufacturing pocket blades since 1981. Basically, they know what works and what doesn’t! 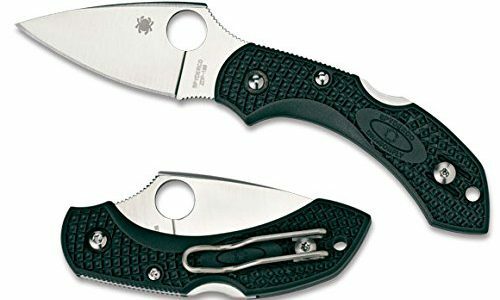 Spyderco Tenacious Plain Edge: The Knife That’ll Never Fail You! Spyderco takes ergonomics very seriously. They understand the importance of how a knife feels in your hand. Because no matter how good the steel, if it feels like crap, it’s useless to me! Having said that, the tenacious feels like it was made for my hand. It grips perfectly! Sharpen Me Up For Free! One of the biggest benefits of buying a Spyderco plain edge is the free sharpening service that comes as a result. You pay for shipping and handling, and let the pros do the rest. 8CR13MOV: Excellent Value Steel That Does The Job! For those who are unfamiliar, 8CR13MOV is the steel type worn by the tenacious. It’s an excellent value steel that holds up fairly well against corrosion. In addition, it’s very easy to sharpen; this makes it a perfect choice for a beginner who wants to improve his/her sharpening skills. If you want to learn more about 8CR13MOV, check out the video below! What I Don’t Like About It – Nothing! There’s honestly nothing negative I can think of! Everything from the locking mechanism, ergonomics, right down to the price, is great. This would easily be in my top 3 list of cool pocket knives! Goshhh where do I start with this incredible timeless classic. Every time I look at a Swiss Army, childhood memories come rushing back. This was probably my first ever pocket knife, and from what I recall, I put it through quite the test. But being the workhorse that it is, not once did it fail me! 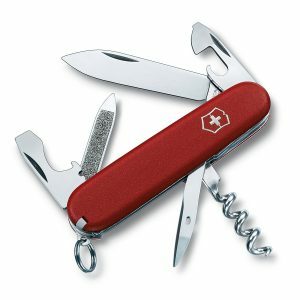 Victorinox Swiss Army: The Champ Of Champs! 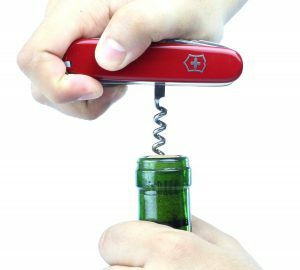 The Sportsman 2 isn’t just a pocket knife; it features 12 stainless steel tools such as a large knife blade, nail file, corkscrew, can opener, and even a screwdriver! Victorinox has you covered for life against any defects in material and workmanship. Even though my Swiss Army knives have taken tons of beating and abuse, I’ve never had to send them back for warranty repair. This alone should give you an idea of how solid they are! Out of all the cool pocket knives I will discuss today, this is by far the smallest on the list. Believe it or not, but this is actually one of the reasons the Swiss Army’s were so popular back in the 90s. You could easily fit it in your jean pockets, and it wasn’t at all a pain to carry around. What I mean by this is unlike the Tenacious for example, don’t expect the blade on this Swiss Army to be comparable. Yes, it’s very effective and will serve you when you need it, but it’s not only just a knife! It’s important to set your expectations right. I carry my Sportsman 2 at all times as a backup knife, and I usually have something else that serves as my primary. By now you probably realize how much I love Spyderco! Not only are they really cool pocket knives, but they’re incredibly ergonomic and highly effective. 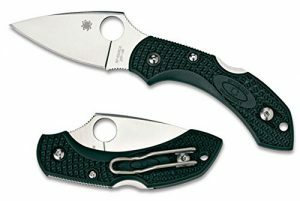 The Dragonfly 2 is one of Spyderco’s biggest seller and fan favorite. Let’s talk about what I like and don’t like about it! Spyderco Dragonfly 2: There Isn’t A Knife That Feels Better! Holding and using this is an absolute joy. A big reason for that has to do with its lightweight construction. Spyderco have opted to go with a fibreglass reinforced nylon (FRN) handle, and this has massively reduced the overall weight of the knife, thereby making it more comfortable to handle and use. ZDP-189 is an exotic steel (some refer to it as a super steel) originating out of Japan. Compared to the 8CR13MOV, ZDP-189 is much harder and of higher quality. Because of its hardness, it’s able to hold its edge for a longer period of time. People who have used ZDP-189 steel knives will agree that it feels like it never dulls! Below is a video testing out ZDP-189 steel. This Is The Definition Of Ergonomics – Seriously! Spyderco Dragonfly 2 is the definition of ergonomics, and I say that without an ounce of hesitation. It is by far the most comfortable folding knife available today (in my honest opinion). Because it’s so comfortable to hold, using it is a breeze and feels completely natural! You can check out latest pricing on amazon by clicking here. You pay the high price because of the quality of steel you’re getting, and for the lightweight construction. While ZDP-189 is an awesome high quality steel that retains it’s edge for long periods, it’s not the best as far as corrosion resistance is concerned. The reason for this is because there is hardly any free chromium in it’s composition (free chromium is what inhibits rust formation). This is particularly important for those who use their knives in highly corrosive environments (high humidity, wet etc.). Small, stubby, and big belly are a few words that come to mind when looking at the Boker Plus Subcom F knife. One thing people don’t realize until they use it, is just how much damage this thing is capable of inflicting! Boker Plus Subcom F: Small, Fat & Stubby, But Also Dangerously Deadly! Rugged & It Can Take A Beating! Someone rightly compared this knife to a bulldog. Both are small, but that doesn’t mean they don’t pack a punch! And just like the Dragonfly 2, Boker have constructed the handle out of fiberglass reinforced nylon (FRN). FRN not only makes the knife light, but also makes it tougher and stronger. All The Best Things In Life Are……Small! One of my favorite things about the Subcom F is its size. If I can get away with carrying a small tool that’s more than capable of doing what I need it to do, why would I carry something bulky!? The closed overall length is 2.625 inches, so it’s small enough to fit in the palm of your hand. Talk about a compact solution! Did You Know You Can Use It As A Money Clip? Yup, that’s right. The pocket clip is reversible and can be used to clip your cash to. I’ve used lots of garbage money clips that loosen up over time, but this isn’t one of them (it holds incredibly tight!). I find the open/close mechanism to be a little bit sticky and tough at times. I am sure this is something that will improve with time, as I break the knife in. We are in the 21st century, and this ladies and gentleman is a 21st century knife. Innovation, technology, creativity, and automation are all the things that make this the coolest of cool pocket knives! This has an LED light…..I mean seriously! That’s pretty darn cool. 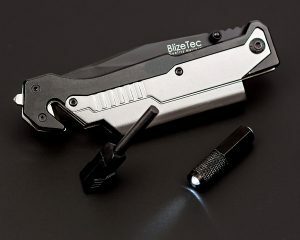 BlizeTec 5 In 1: The James Bond Of Knives!? It’s one thing to own cool pocket knives with fancy looking blades and opening mechanisms, but it’s another to have a knife tailor made just for survival. And that’s exactly what this is: 5 In 1 tool that comes with a fire starter, LED light, seat-belt cutter, window breaker, and of course last but not least, a plain/serrated combination knife. It’s unlikely that I’d ever use the seat-belt cutter or the window breaker, but I’d for sure use the fire starter and LED light! What from the 5 is your favorite? Leave it in the comments! First off the customer service offered by BlizeTec is excellent. Dealing with these guys is easy and painless. This particular knife is backed by a lifetime warranty, so any defects in workmanship and you’re covered. It’s great seeing a manufacturer ready and willing to help customers if the need arises! What really makes this knife different from the rest is how useful it could prove to be in dire circumstances. Now I don’t wish crap upon anyone, but if you were in a car accident (god forbid of course!) and it were a matter of life and death, you’d want to have this tool at your disposal. Including this tool in your car and home emergency kit is a very good idea, even if you never end up using it! You Never Know When The Seat Belt Cutter Or Window Breaker Could Come In Handy! Difficult To Open/Close With One Hand! The open/close mechanism could definitely use some improvement. Opening with one hand is exhaustive and requires strong wrists (which I don’t have), but it’s still manageable. Closing is near impossible for me, since you need to push down on the liner lock and then using the same hand, push the blade closed. The liner lock is too hard to release, in my opinion. Number 7 on our list of cool pocket knives is the Kershaw Ken Onion Blur. This no-nonsense tactical knife is known to be a favorite of law enforcement and military officers. There is one thing I love about this knife more than any other on this list: keep reading to find out! Kershaw Ken Onion Blur: Fast & Furious! The Open/Close Mechanism Couldn’t Be Better! This is where Kershaw have really set themselves apart from the rest. 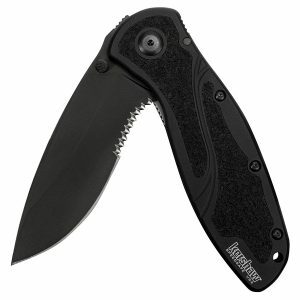 This knife along with other Kershaw best sellers, uses a technology known as SpeedSafe Assisted Opening. Essentially, this makes opening the knife not only easy, but astonishingly quick! I mentioned earlier that military officers use this…..now you know why. Out of all the cool pocket knives I’ve talked about so far, this has the best open/close mechanism in my opinion. Watch the video below to see what I mean! Better Corrosion Resistance: 14C28N consists of slightly more free chromium in its composition compared to 8CR13MOV. The more free chromium, the more corrosion resistant the steel! Longer Edge Retention: Because 14C28N is a slightly harder steel than 8CR13MOV, it is able to hold/retain its edge for longer. Longer edge retention means I need to sharpen less often! 6061-T6 anodized aluminum aka aircraft aluminum is what the handle on this knife is made of. Other than being lightweight, it’s scratch proof, durable, and more than able to take a couple knocks. What I Don’t Like About It – Not Much I Can Say Here Except…. There’s hardly anything negative I can think of about this knife. If I am being overly critical, it’s not the most discreet to carry around and you may get some unwanted attention because of that. Ever hear the saying old is gold? If you agree with it, then you’ll love number 8 on our list of cool pocket knives. Step forward the Opinel number 8: a knife that has been around for more than a hundred years! Opinel No 8: The Grandfather Of Pocket Knives! It’s Not Just A Knife, It’s Art! 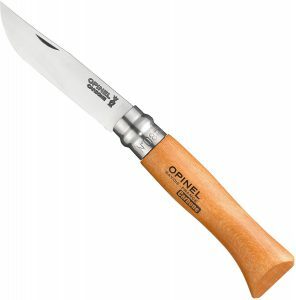 Did you know that the Opinel knife was ranked as one of the 100 most beautiful products in the world? It’s not difficult to see why! Interestingly enough these were used as picnic knives back in the 80s, but people use them for pretty much everything nowadays. There’s a certain charm about simplicity……which brings me to my next point! Earlier in this post we mentioned the BlizeTec survival blade, and that to many is the king of cool pocket knives. I too am a big fan of fancy locking mechanisms, fire starters and all these crazy multi-tool capabilities, but I am also a fan of simplicity, especially when it’s done right! Opinel number 8 achieves exactly that. There’s a steel blade, hardwood handle, rivet, and a locking collar and that’s it! Simple, effective, and beautiful! Because this is a carbon steel, it’s more prone to rust than some of the other steels. Rust is something you can prevent by properly caring for and maintaining your knives. Preventative measures may include thoroughly drying your blade when wet, routine oiling, and storing them in a cool dry place. Number 9 on my list of cool pocket knives is similar to number 8 (Opinel); they’re both old school and have been around for a much longer time than I have. And there’s a reason for this…..they’re effective, practical, and continue to remain stylish and trendy! Buck 110: Made In The USA & Been Around For More Than 50 Years! 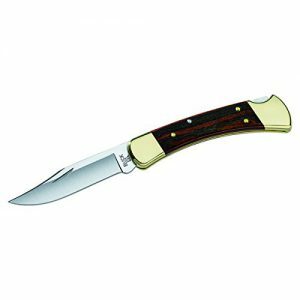 Buck 110 features a 420HC type steel. This is considered a low to mid range quality steel, but there’s one thing that makes Buck 420HC much better than any other 420HC: heat treatment. Properly heat treating a steel can make it harder, and more corrosion resistant. Having said that, I like the 420HC steels specifically out of Buck. They’re one of the most corrosion resistant and at the same time easy to sharpen. You get a leather sheath as an extra when purchasing this knife. Don’t know about you, but that’s one less thing I need to spend on! You Get A Free Leather Sheath To Store Your Knife In! Forever warranty as the name suggests, means you’re covered for life. Many of the cool pocket knives we have talked about also have lifetime warranties. Again, pretty cool to see that these guys have so much confidence in their products. Also, in case you’re wondering 110 is made in the USA! If you carry your knife in casual shorts, you wouldn’t be too thrilled to carry this thing around. Using it with the leather sheath on your belt is a more comfortable alternative, in my opinion. Many of you will bash me for adding this in here, but I absolutely needed to because it’s a gem. I’m not so sure that this tool falls in the category of “cool pocket knives”….maybe more of a cool multi tool. Anyways, it’s an awesome tool and that’s why I wanted to speak about it! 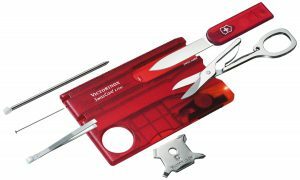 Swiss Card Lite By Victorinox: A Credit Card Sized Tool That’s Perfect On The Go! Toss It In Your Wallet! The fact that you can store this in your wallet makes it different from all the other 9 tools we have discussed so far. No pocket clips, no sheaths, no lanyards, none of that! Throw it in your wallet with your credit cards, and finito. Problem solved. There’s 13 different tools that make up the Swiss Card. My favorite and most used is the pen and ruler, believe it or not!. How many times have you been in a situation where you really needed a pen but didn’t have one!? Not anymore. Similar to the Sportsman 2 we talked about earlier, your Swiss Card Lite is covered by a lifetime warranty. I’m a little disappointed in the Swiss Card blade. I think the right term for it is wimpy. The handle feels very flimsy, and because of that you can’t have it replace your primary knife. Overall still a great tool which has proven useful on so many occasions. Two thumbs up! 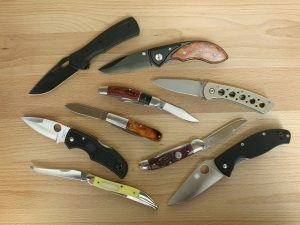 These are my top 10 cool pocket knives….what are yours? Feel free to share them by leaving a comment below. Before I end this post, I want to reiterate what I said at the start: your needs specifically will differ from someone else’s, so take the time to understand what it is you’re looking for before you start looking. Be sure to check out as many reviews as you can, and contact the manufacturer with questions if you need to! Finally, if you enjoyed reading, a share would be appreciated. See you next week! A Buyer’s Guide To Chef Knife Bags! Should You Buy A Knife Sharpening Angle Guide Tool? Knife Sharpening Books: Do You Really Need Them? 3 Simple Knife Sharpening Tips And Tricks Everyone Could Use!